At the end of May 2007, Tranmere Rovers goalkeeper John Achterberg has agreed a deal to become a player-coach of the League One club. The 35-year-old Dutchman will act as second-choice at Prenton Park after agreeing a new two-year contract until 2009. 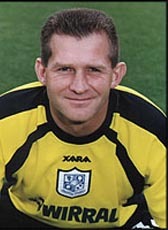 John Achterberg joined Tranmere Rovers in 1998 and already coached the young goalkeepers at the club for some time. He is now pleased that the club has given him the opportunity to make it a permanent role. In June 2009 John Achterberg left his role as goalkeeper coach at Tranmere Rovers to take up a position as reserve team goalkeeping coach at Liverpool. John Achterberg has been at Tranmere for 11 years as a player and coach, making more than 300 appearances.